Alabama School Connection » What Happens When Education Officials Don’t Follow The Law? Over the past ten years of advocacy, I’ve been surprised and disappointed to learn about laws and rules that are in place and how our K-12 public school officials seem to disregard those laws and rules. Too often, I, like many parents, have been put in the position of policing my local district, which strains fragile relationships among families and schools. I will share multiple examples of laws that appear to be being ignored, from academic reporting to charging school fees to financial reporting to creation of documents required by law. Let me be clear: I am not claiming that any particular system has broken the law nor will I name names. My purpose is to call attention to laws that are not being followed to stimulate discussion about (1) whether these laws are worth following, and (2) if they are, what should be done to force compliance? So which laws and rules are our education officials supposed to follow? Well, the Alabama Constitution serves as the starting point when looking at what the law says in Alabama. The Code of Alabama serves to lay out what enacted legislation says about a particular subject (in our case, education). The Alabama Administrative Code is then developed from the Code of Alabama and serves to lay out further rules that an agency (in our case, the Department of Education and State Board of Education) must follow. Just for fun, I’ve compiled a page of laws (rules to be added later) from the Code that apply to our schools. I was inspired by this school district’s Elementary School Handbook which so carefully delineates the laws that apply to students and families (starting at the bottom of page 35). I have poked around the Code of Alabama and the Administrative Code from time to time when researching particular subjects, and recently I came upon Section 16-6B-7 of the Code of Alabama, which mandates “Accountability Reports to the Public“. It not only reminded me why I wanted to write this, but provides a perfect first example. Act 1995-313, the source of the section below, was passed in 1995 with much fanfare about how it would improve accountability and parental involvement and how our school community would be much better informed about what types of progress our schools were making. Important parts of it appear to have been ignored. Accountability reports to the public. (1) A Funding and Expenditure Report which shall include those documents specified in Section 16-6B-4 and which shall include the amount of Foundation Program funds or vocational/technical education funds, or both, earned and of all funds expended and any other data deemed necessary by the local board of education or the State Board of Education to inform the public about the financial status of each school. (2) A Student Achievement Report which shall include a comparison of the immediately previous school year with the previous five years regarding student performance on testing required by the State Board of Education, dropout rates, attendance rates, graduation rates, college attendance, and any other data deemed necessary by the local board of education or the State Board of Education to inform the public about student achievement in each school. (b) These reports shall be released to the media, presented to parent organizations, members of the Legislature who represent the schools covered in each report, and the State Superintendent of Education. These reports shall be made available to the public upon request on or before ninety (90) days after the end of the fiscal year. any other data deemed necessary by the local board of education or the State Board of Education to inform the public about student achievement in each school. I have never seen one of these reports produced by a local board of education. 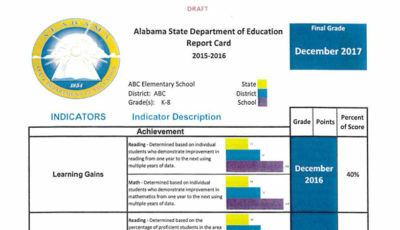 The ALSDE previously produced “report cards” for each school and school district, but hasn’t produced one since the 2008-2009 school year. You can access those report cards here (click the link, then choose a system and you’ll see they end after the 2008-2009 school year). I found an annual state report from 1999 that did actually have five years of comparison data, but I couldn’t find any local school district report cards that did what the law required. You could say, well, they have that whole Accountability Reporting System thing. But that only compares two years of data, not five. (Here’s the ALSDE’s guide to using the reporting system, and it states clearly that only two years of data are available.) Plus it’s very cumbersome to obtain those reports. And there’s no good way to compile them into an understandable format so you can really look at student achievement from year to year….for the previous five years, as the law states. Even the “status reports” only include one year’s data. Somewhere, somebody (our Alabama legislators and those who pushed for passage of this law), 17 years ago, thought it would be a good idea to share these reports with the public that financially supports our public schools. So why haven’t these reports been produced and shared as they are mandated by law? I know that if I break the law, there is some consequence, some penalty. I know that if a student never turned in an assignment, they would probably not only have gotten a grade of zero, but their GPA would have been negatively affected. And had they broken a law at school, well, that’s pretty much a no-brainer. There would have been consequences for that student. And yet, here’s the first example of our local boards of education, and ultimately our state department of education, failing to follow the law. Where’s the penalty, the consequence? Who is responsible for ensuring that these reports were produced? How might this information have been utilized to better allow the public to be engaged in their local schools and districts? We’ll never know. And worse, there are no consequences for their having not produced the reports. There are only 17 lost years of public engagement. Yes, the entire public accountability reporting system got an overhaul with the passage of the Legislative Grading and Performance Bonus system bill last May. Most likely the new law will replace Section 16-6B-7, but until that time, these report cards should have been being produced, as I can find no law that was passed excusing local boards from doing so. And….the requirement is still in the Code of Alabama. Sadly, this isn’t the only instance I have uncovered where local boards have failed to follow the law. When the Student Harassment Prevention Act of 2009 was passed, there were deadlines set within the law that many school boards failed to meet. Without naming names (because it no longer matters, I suppose), in October of 2010 I learned of one board that had failed to approve and produce the required reporting form by the July 2010 deadline. This was one of those school systems that everyone looks to as a model, and here they were breaking the law. And yet, there was no penalty. The only ones that were penalized were the students for whom the form was not available. I asked the ALSDE if perhaps those that should have had the form approved could be required to perform community service. I never received a response to my request. Click here to read the full Student Harassment Prevention Act in the Code of Alabama. In the review conducted this past June, I found four districts who were still not in compliance with the law, three years after its passage, and nearly two years after the deadline had passed. Consequences? Nope. I have been unable to determine whether those four districts are yet in compliance. Just last week, I was asked to help force a school system to actually place the required reporting forms into counselors’ and principals’ offices as required by the law. The deadline for compliance was more than two years ago. Bills were introduced in 2011 and 2012 that sought not only to strengthen the Student Harassment Prevention Act, but also to enact penalties for schools who fail to follow the law. However, the penalty was to withhold state funding, and one could reasonably argue that withholding state funding punishes the wrong people. Before we look at possible consequences and penalties, let’s look at another area of noncompliance with state law, one which costs Alabama’s families hundreds of dollars of their household income each year. Fees cannot be charged for anything at all in “the first six grades” (K through 5). Nothing. Nada. No fees. For anything. Fees for field trips during the school day are “voluntary contributions” and that must be stated clearly on the field trip form. Say what? How many times were my children frustrated with me because I forgot to send field trip money and they “wouldn’t get to go” unless I sent that money in on time. Why was I never told that my children could not be denied access to the field trip if I didn’t pay? Voluntary contributions may be requested for various items purchased by the school that are used by students in academic courses and classes including workbooks, supplemental instructional materials, lockers, sheet music, and other academic purposes. The voluntary nature of the contribution must be clearly stated in the request for the contributions. Nonpayment of requested contributions cannot be used against a student and the student must be provided the same instructional items as if payment was made on behalf of the student. Donations may be requested for specific school purchases, including janitorial products, cleaning supplies, paper products, copier expenses, software maintenance, and other school purposes. The voluntary nature of the donation must be clearly stated in the request for the donation. No fees may be charged for courses required for graduation. How many School Supply Lists would you like to see that appear to violate these laws? I have been collecting these lists for nearly two years and have nearly 100 lists that are in clear violation of these laws. Very few schools clearly state that the boxes of Kleenex or copy paper or hand sanitizer are “voluntary” in nature. And how many families really believe that even when the supply list says “voluntary $15 donation to cover lab supplies” that their child won’t somehow suffer personal repercussions if the family doesn’t pay the $15 fee? (1) A monthly financial statement showing the financial status of the local board of education accounts with itemized categories specified by the State Board of Education. (2) A monthly report showing all receipts and the sources thereof. (3) A monthly report showing all expenditures with itemized categories specified by the State Board of Education. (4) An annual projected budget. (5) Monthly and/or quarterly reports showing expenditures relative to such projected budget. (6) A yearly report of the fixed assets inventory of the local board of education with itemized categories specified by the State Board of Education. (7) Financial and other information necessary to participate in national statistical studies on education. (b) The financial information required in subsection (a), as well as any other financial information which the State Board of Education shall require, shall be submitted in writing and/or electronically to the Chief Education Financial Officer by the 15th day of the month following its presentation to the local board of education. (d) All financial documents, in whatever source maintained, are public documents, and shall be open to inspection and accessible to the public. An annual budget and monthly financial statements with supporting spread sheets as submitted to the State Department of Education shall be made available to the general public at the local school system Internet site. A very cursory peek (less than 15 minutes) around Alabama’s school district sites found four of the 12 sites that I viewed to not be in compliance with the “15th day of the month following its presentation to the local board of education” part of the law. The ALSDE has clarified that this means districts should have the reports posted to their web site 45 days after the end of the reporting month, e.g., August 2012 should be posted by October 15 2012. When I performed a review of school district web sites in 2009 and 2010, I found that while many of the 132 existing districts had the required financial statements online, too many did not. I know. I can hear administrators and central office folks saying, “but gosh, we were just a few days late” or “we are overworked and it’s tough to remember all of the details”, but it’s the law. And before the 2006 law existed, getting financial information like check registers was extremely difficult (now they’re supposed to posted online monthly in the same manner as other financial reports). And still, there are no penalties when school officials do not do what is required of them. Section 16-13-140(c) Each local board of education shall hold at least two open public hearings pertaining to its proposed annual budget. Copies of the proposed budget shall be provided to the public at each hearing on forms provided by the State Department of Education. Each board shall seek input from the public concerning the proposed budget and the allocation of resources. Each hearing shall be held during a scheduled board meeting in a place and at a time convenient for the general public to attend. The chair of each board shall publicize the date and time of each hearing in the local media in advance of the hearing. In addition, notice of each hearing shall be posted in a conspicuous place at the offices of the local board of education, the county courthouse, the main municipal building, and at each affected school. The proposed budget shall reflect the total amount of resources available to the board from all funding and revenue sources. The projected enrollment and the total proposed expenditure by each board and for each school shall be available at the public hearings. The proposed budget shall clearly delineate the number of teachers, librarians, counselors, administrators and other support personnel projected to be employed at each school. The proposed budget shall clearly list the operating costs by category or function at each school. 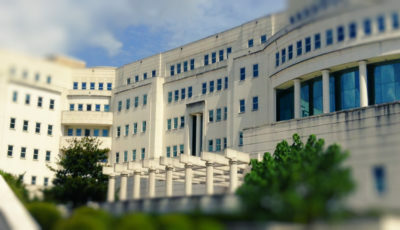 The proposed budget shall delineate by school those operating resources earned, including, but not necessarily limited to, those items contained in the Instructional Support Program of the Foundation Program, designating the amount of funds earned at each school per item based on average daily membership. After at least two public hearings have been held, the local board and superintendent shall cause a final budget to be developed consistent with the laws of this state, and shall make copies of the final budget available to the public upon request. Copies of the budget and other financial documents may be secured from the superintendent at a cost not to exceed the cost of production of the document. So….the hearings are to be conducted during regularly scheduled board meetings. NOT special called meetings? In August, I contacted each of Alabama’s 134 school districts to gather the dates, times, and places of all district budget hearings, and received responses from a fraction (less than a third) of the school districts I contacted. And of the 37 districts I did receive responses from, only four of those school districts appeared (as I was unable to confirm) to have held their budget hearings during a regularly scheduled board meeting. 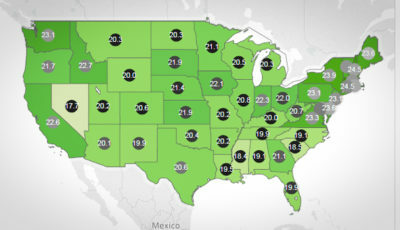 The remainder of those school districts held hearings less than 30 days apart and the majority of them held their budget hearings between 7 and 13 days apart. The law, by stating the hearing should be held during a regularly scheduled meeting, also implies that the board should be present in a quorum, right? I can name (but I won’t) at least one board where the board never even attended the budget hearing. And this, too, was in a district that many look to as a model of greatness (in fact, their CFSO has won numerous awards for best business practices). And no, there were no penalties imposed on this district for the many years of holding budget hearings not in compliance with the law. Budget hearings are to be held in a place and time convenient for the public to attend. Does that include 8:00 in the morning? Or 3:30 in the afternoon, when most parents are retrieving their children from school? To their credit, most of the districts that responded to my request held at least one hearing between 5:00 p.m. and 7:00 p.m. in the evening, which should allow for attendance by school community members. And don’t even get me started about the whole “shall seek input from the public concerning the proposed budget and the allocation of resources” thing. 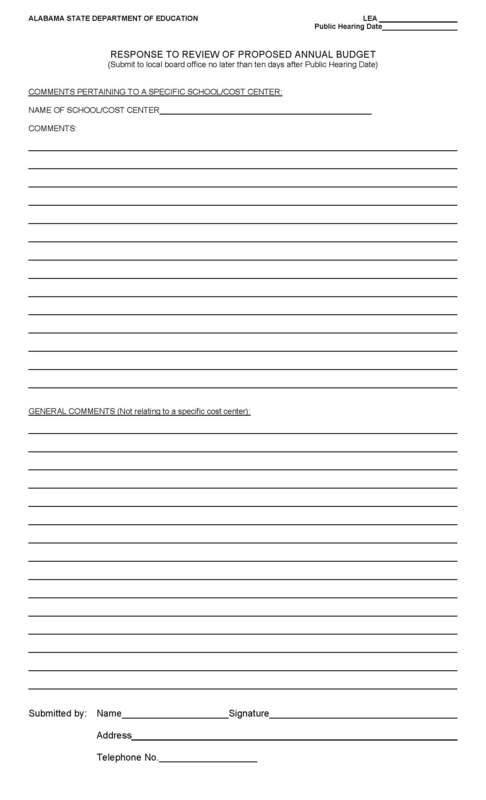 While the public is given an opportunity to provide written input on a form provided by the school district (created by the ALSDE), you have to wonder what is done with the input, considering that the budget is usually passed within days (if not the same day) of the budget hearing and the form asks you to provide the input within 10 days after the hearing. I haven’t even brought up special education and compliance with Individualized Education Programs (IEPs), as that deserves an entirely separate presentation. This is another area where parents and families are forced to police school personnel to ensure services are provided in accordance with federal law. 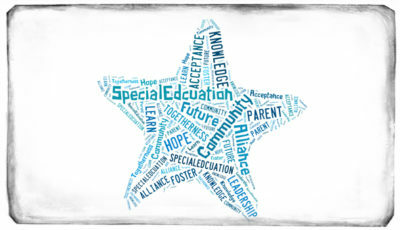 It is simply too much to ask of parents and families of children with special needs, and interferes with the already-fragile relationships among families and schools. Too many lawyers are making too much money off of school districts whose personnel fail to follow IEPs and provide proper services to children with special needs. What Should Penalties or Consequences Look Like for Officials Who Do Not Comply with the Law? Now that we’ve looked at various areas where education officials are not in compliance with current law, let’s consider possible penalties and consequences. The only penalty that is available to the ALSDE to use against a school system that is not in compliance in some of these areas is to withhold state funding. Withholding state funding from school systems penalizes more than just those personnel who are responsible for ensuring that the law is followed. So doesn’t that seem like overkill? If the job to get financial statements posted to a web site resides with a particular person within a district, shouldn’t there be some penalty for that person for NOT doing his job? What about the board that failed to approve the required reporting form for students on which they should report harassment? What about the four boards that even as of June 2012 were not in compliance with the law? Or the one who still has not made the forms available in counselors’ and principals’ offices? Shouldn’t there be some penalty? If there is no penalty, what is the point of having the law? What incentive do school districts have to follow the law? What about boards who knowingly, willingly, and without fear of penalty continue to disregard the budget hearing law? Why does no one particularly care that they are not in compliance? Isn’t the single most important function of a board to pass the school district’s budget? Isn’t that where all functioning of a school system begins? Why bother to put words to paper that require public input when the mechanism to allow for the incorporation of that input is noticeably absent? And what does it say about school leaders who willingly, knowingly thwart the law even after they have been notified that they are not in compliance? Are those the people that really need to be running our schools? How are they held accountable? What does it say about the State Department of Education that it took on the responsibility of producing local school district report cards annually, which noticeably barely 5 years after the law requiring certain parameters to be reported was passed were not producing report cards in accordance with the guiding law? We must develop meaningful incentives and penalties to entice and/or force school districts to comply with the laws that are created to govern our public schools. The reason for pointing all these areas of noncompliance out to our school community is not to accuse them of criminal activity or to suggest that our school officials should be thrown in jail, but it is to say that we must hold our education officials accountable for the laws and rules that they create for themselves. They certainly hold us (and our children) accountable for the rules they create for students. How we hold them accountable is up for discussion. No one is suggesting jail time, but there must be some mechanism in place to hold education officials’ feet to the fire to follow the rules and laws created to govern our public schools. All of the laws I have pointed out were more than just good ideas. Someone thought so much of them that they were enacted after (probably) much debate by our elected Alabama legislators. A lot of effort went into these laws. Who is supposed to enforce these laws? Surely these laws are worth following, aren’t they? And if they aren’t, then we need to create better laws that are meaningful to those who are required to follow them. Simply not following the law because it’s inconvenient is just not acceptable. If the law isn’t good, change it. But until it’s changed, it must be followed. As written. Please share your thoughts here or on our facebook page.